Go ahead, plant a seed. See it disappear into the dirt. But, don't forget! The four items of our focus — seed, towel, promise, and torchlight — seem so ordinary, so simple. These four items were part of the day-to-day world of Jesus. He often used the example of a seed in his teaching. A towel was part of the mandatory washing before meals in Jewish society. Promise was the currency of Jewish faith. Torchlight was all they had to drive the darkness away. Four common things from Jesus' world become four key witnesses to Jesus and his glory. We looked briefly at the power of a seed a few days ago. Today let's focus on the mystery of a seed and the power of God that brings glorious new life out of his Son's death. Even more, let's remember that the power of a seed is also a guarantee to us! What a foolish question! When you put a seed into the ground, it doesn't grow into a plant unless it dies first. And what you put in the ground is not the plant that will grow, but only a bare seed of wheat or whatever you are planting. Then God gives it the new body he wants it to have. 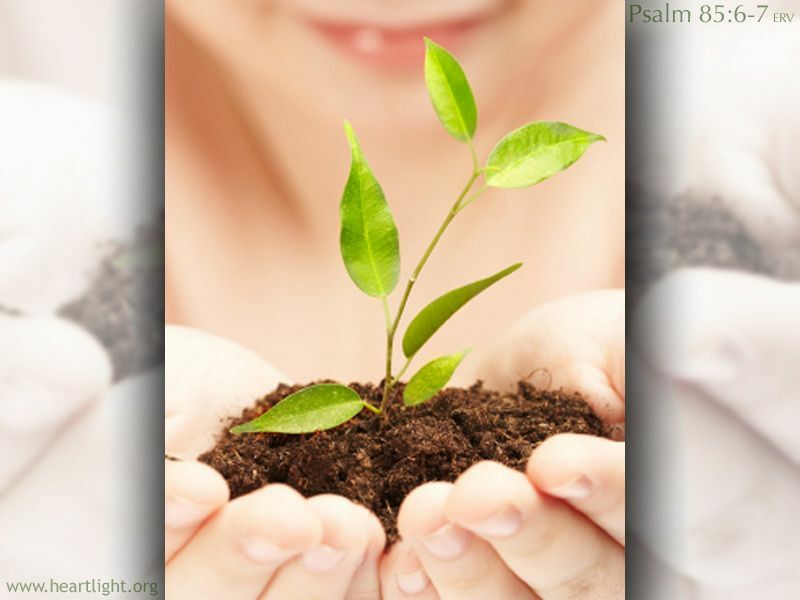 A different plant grows from each kind of seed (1 Corinthians 15:35-38). The Holy City of the Jews, Jerusalem, was filled with people and with expectation. Passover was happening soon. Lazarus had been raised from the dead just outside of the city. 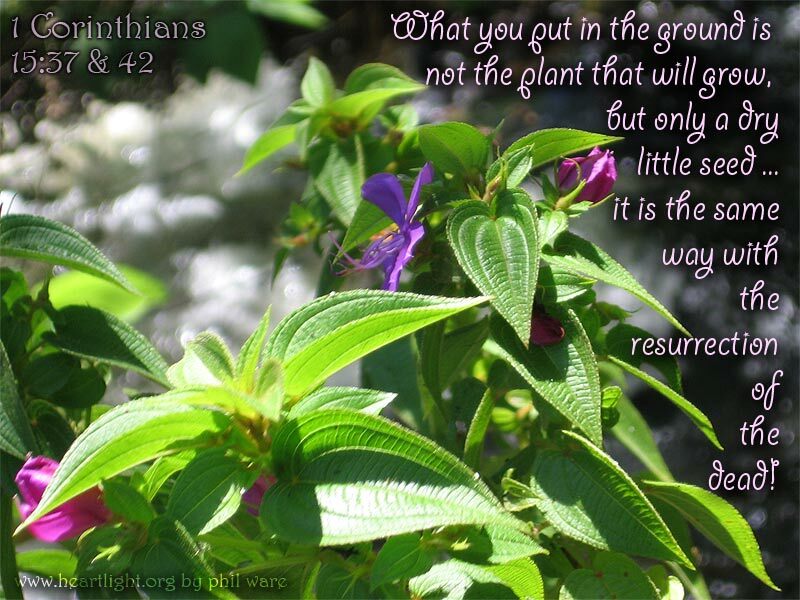 Jesus' reputation had been growing throughout the land. His followers were looking for the kingdom of God to come with power and glory. Jesus had ridden into town accompanied by their cries of his right to be king and with their praises echoing down the walls and avenues. Tension was at the breaking point because the religious authorities wanted Jesus and Lazarus dead. They also wanted Jesus' movement stamped out. Jesus replied, "Now the time has come for the Son of Man to enter into his glory. I tell you the truth, unless a kernel of wheat is planted in the soil and dies, it remains alone. But its death will produce many new kernels — a plentiful harvest of new lives" (John 12:23-24). He said this to indicate how he was going to die (John 12:33). All throughout his ministry, Jesus chose to use normal, simple, images from everyday life to teach eternal truths. Now, as the whole prospect of his death loomed ahead, Jesus was planting ideas, eternal concepts, into the hearts of his disciples. They could not fathom them at the time. After his resurrection, however, these truths came to full bloom in their hearts as they began to understand what he had done for them in his Passion. With the coming of the Greeks, he knew the time of his death was near. He had tried to prepare his little band of faithful followers for what lay ahead, yet they couldn't understand. How would the masses that had heard of him raising Lazarus, understand? He was going to die. Their Messiah, the mighty — yet humble, Son of Man, was going to give up his life. The Son of David would hang on a cross before he came in glory. They could not understand. So, Jesus planted a thought about a seed in their minds. A seed is only an ugly, small, thing unless it is put into the ground and dies. Until the seed meets dirt, darkness, and isolation, it is just a seed. But, when the seed gives itself up to the earth, wonderful things happen. Bounty — multitudes of seeds! The seed bears witness to us. If we are honest, we can't really understand why Jesus had to die. Oh sure, our heads can go over the details — someone must die for the sins of the world; yes, it is God's will that his son would be the sin offering; and of course, love must triumph over hate and sacrifice defeat the abuse of power. In our hearts, however, how do you understand the Creator submitting to the ill will of the created? How do you understand God dying on a cross? Why would the Almighty withhold his power and submit to death when he had the power to defeat his enemies and never suffer and die? Most of all, how could someone so perfect be willing to stand in the place of all of us — in the place of people like me — who are so imperfect? The raw glory of Jesus' ministry, the depth of his love and compassion along with his righteous perfection, is dimmed by the glory of his loving sacrifice. Hell's fury is swallowed up in love just as surely as a seed's form is burst and swallowed up in the beauty of the flower. Hate, jealousy, and the abuse of power can destroy the physical form of their enemies, but they cannot stop the seed from producing a harvest of love, joy, and peace. Spring is upon us just as surely as Passover and Resurrection Sunday are on the horizon. Every time a seed — long buried in the dirt and forgotten in the cold of winter — bursts through the ground we are reminded of Jesus' triumph over death for us. Every bud on every tree that rustles in the spring winds whispers aloud the truth: "Risen!" Just as the ground cannot claim the seed, hell cannot contain the grace of God in Jesus. The darkness of dirt, whether in the ground or in the human heart, cannot hold back the love of God and his desire to redeem and reclaim us. Go ahead, plant a seed. See it disappear into the dirt. But, don't forget: the dirt enlivens the life inside the seed; it does not extinguish it. The darkness of the dirt ensures that life will one day soon burst from the ground. And, dear friend, because Jesus is The Seed, life and glory await us all who find our life in him. 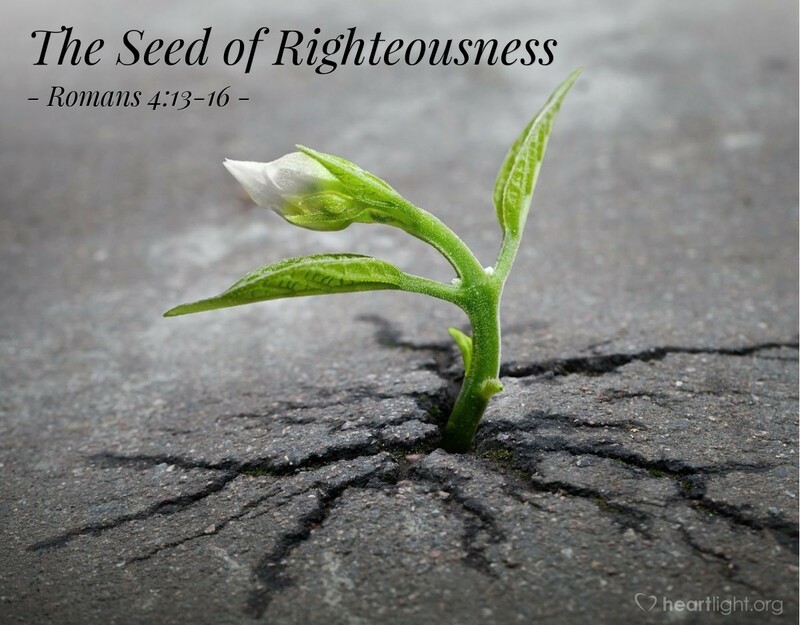 No hell, no hate, no dirt, no darkness, no death can hold us captive because we believe the witness of The Seed! 1 + 1 = Many! "Seed, Towel, Promise, and Torchlight: The Seed" by Phil Ware is licensed under a Creative Commons License. Heartlight encourages you to share this material with others in church bulletins, personal emails, and other non-commercial uses. Please see our Usage Guidelines for more information.